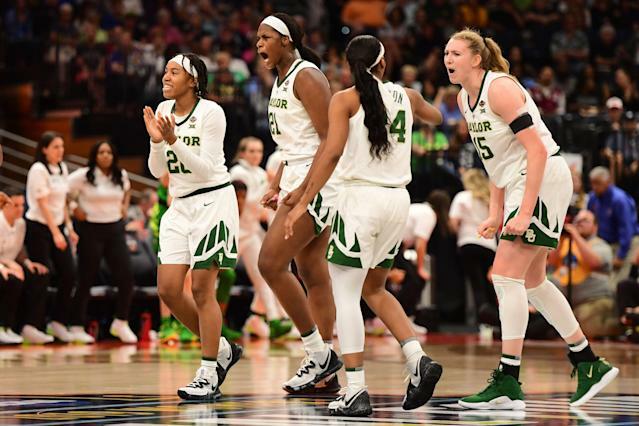 A stark clash of styles lived up to its billing at the Final Four on Friday as Baylor edged Oregon in a thriller to advance to the women’s national championship game. Oregon delivered on its reputation as a 3-point shooting threat, but Baylor’s size and defensive prowess proved too much down the stretch in a 72-67 Bears win. With the victory, the Bears advance to Sunday’s national championship game, seeking a third national title under head coach Kim Mulkey. The Bears took control early, working the ball into the post on offense while holding Sabrina Ionescu off the board in building a 19-15 lead in the first quarter. But Ionescu, the national player of the year, found her stride in the second quarter, scoring 12 of Oregon’s 19 point in the stanza that included a four-point play to give the Ducks a 34-33 lead heading into halftime. From there, it was a constant battle back and forth as the Bears and Ducks traded the lead for much of the second half. But the Bears leaned on their signature defense in the game’s final minutes, holding the Ducks to three points in the game’s final 6:13 as Oregon shot 1-of-13 from the field down the stretch. The Bears held opponents to an NCAA-low 31.3 percent field goal percentage in the regular season. It was that ability to stifle the Ducks in the game’s waning moments that ultimately punched Baylor’s ticket to the championship game. Baylor won without hitting a 3-pointer while scoring 48 of its 72 points in the paint. It was typical of a Bears team that averaged just 3.2 3-pointers per game this season. Oregon, the nation’s best 3-point shooting team with a 41.9 percent success rate, connected on 12-of-32 shots from distance, but couldn’t compete in the paint with a team that also led the nation in rebounding differential and blocked shots in addition to owning the game’s best field-goal percentage defense. Oregon shot 36.8 percent from the field while the Bears’ inside game led to a 54.4 percent field-goal rate. The Bears leaned heavily on their pair of All-Americans to secure the win. Kalani Brown, a 6-7 center, led the way with 22 points and seven rebounds. Lauren Cox, a 6-4 forward, tallied 21 points, 11 rebounds, seven assists, three blocks and two steals. Ionescu, who may have played her final game for Oregon as the top prospect for the WNBA draft, finished with 18 points, six assists and four rebounds. She said after the game she hadn’t decided about whether to turn pro. "I have no idea,” Ionescu said. “I haven't thought about any of that yet. I'm going to get back and figure out what's important to me and what I'm going to do." The Bears will face Notre Dame in Sunday’s national championship game.